Owen Jones's call for Corbyn to stand down won't solve Labour's fundamental problems -- but it could be a gift to the party's right. Guardian columnist Owen Jones is by some distance the most prominent left-wing commentator in Britain. Author of two bestselling books, a frequent guest on television programs, Jones has half a million followers on Twitter and supplements his articles for the Guardian with a regular stream of videos. Indeed, such has been his success across a wide spectrum of media it wouldn’t be a surprise to see his face beaming from the cover of a video game some day. Recently he used his platform to deliver a stinging verdict on Jeremy Corbyn’s record as leader of the British Labour Party, and to suggest that Corbyn should prepare to step aside in favor of a more suitable candidate. In itself, there is nothing wrong with suggesting a change of personnel at the top; no individual should be given priority over the wider political cause. But the arguments made by Jones greatly underestimate the difficulties faced by Corbyn since autumn 2015 — and thus exaggerate the ease with which Labour’s problems could be solved by a new leadership team. The course of action he suggests is far more likely to end in failure and retreat than it is to reinvigorate the prospects of left-wing advance in Britain. Those currently turning away from Labour are not doing so because the party wants to invest in the economy rather than cut, or introduce a genuine living wage, or return public services and utilities into the hands of the British people, or increase workers’ rights . . . it is soul-destroying to watch great ideals and policies being dragged down, not by their own merits, but through a lack of strategy and basic competence. This has obvious implications for any future leadership committed to a left-wing agenda. They would face the same implacable opposition from Labour’s right that Corbyn has had to grapple with, no matter how good their media strategy was. In fact, a politician better able to build popular support for these policies would likely face even stiffer opposition. In any case, it is a good thing that Jones is not calling for Labour’s current platform to be diluted in pursuit of electability. However, the list of policies that he reels off has one notable omission: it contains no reference to Britain’s role in world affairs. It is of course true that national elections tend to be fought primarily on questions of domestic policy. But one of the most important elements of Corbyn’s platform has been his rejection of Labour’s deeply ingrained Atlanticist tradition. Jones mentions the Labour leader’s opposition to the Iraq war; he might also have noted that Corbyn was one of the few British MPs to oppose NATO’s intervention in Libya from the start. More recently, Corbyn, and his colleague Shadow Foreign Secretary Emily Thornberry, have strongly challenged British support for the Saudi war in Yemen. Labour’s foreign-policy stance has generated more controversy than anything else under Corbyn’s leadership. But at a time when Britain’s “special relationship” with the US requires the utmost servility towards Donald Trump, the call for an independent line has the potential to win broad popular support — as Jones has recognized, by involving himself prominently in Britain’s anti-Trump protests of recent months. In his critique of Corbyn’s leadership, Jones refers to “various terrible missteps” which “played directly into the Tory narrative.” He does not specify what those missteps were. There is, of course, no objective measure of what constitutes a “gaffe” for a politician. For many of his critics, Corbyn’s visit to the Calais refugee camp was just such a gaffe; for others, it was a brave and necessary step in crafting “a narrative on immigration that didn’t mean indulging xenophobia” (as Jones puts it). Jones remarks that “Britain’s press is owned by an aggressively right-wing media cabal who demonize anyone who even vaguely challenges the status quo.” This certainly describes the greater part of the British media. But Corbyn has also been subjected to continual flak from outlets not usually considered “aggressively right-wing” — in particular, the Guardian and the BBC. This is in many ways more damaging for Labour than attacks from the Tory press. Everyone knows what the Mail and the Telegraph stand for, and few people expect them to give any Labour leader the time of day. The BBC reaches a much bigger audience than all the newspapers put together, and is more widely trusted because of its declared impartiality. The Guardian markets itself as a progressive, left-leaning publication, and its readership includes a significant part of Labour’s base (especially when we take account of its online reach). In the case of the BBC, the anti-Corbyn bias has been so egregious that the channel’s former political editor Nick Robinson felt moved to protest. Robinson’s successor Laura Kuenssberg was even reproached by the BBC Trust for crudely distorting Corbyn’s answer to a question about the Paris attacks — a response which was weaponized by his opponents to undermine Corbyn’s credibility on security issues. The Guardian, for its part, has been overwhelmingly hostile to Corbyn’s leadership from the first day. In addition to the main political columnists, journalists who normally write about art or fashion have been drafted in for the task at hand, making the paper resemble a besieged medieval town where even the children have to learn how to pelt down rocks at the barbarian hordes. The rule of thumb has been simple: Corbyn should be given the credit for nothing and the blame for everything. If Labour wins a by-election in Oldham, that was all thanks to the local candidate; if it loses a by-election in Copeland, Corbyn’s leadership was the relevant factor. Logic and principle can be turned on their head in the name of a higher cause. Two of the Guardian’s leading voices, Jonathan Freedland (its opinion editor) and Polly Toynbee, can attack Corbyn one day for refusing to advocate new controls on immigration, which would certainly require Britain to leave the European single market — then pillory him soon after for not doing enough to oppose Britain’s departure from the self-same single market. None of this is especially surprising; it’s entirely predictable that the Guardian would sooner warm to George W. Bush than to Corbyn, for all its progressive posturing. And Jones is right to insist that any serious left-wing project will have to overcome media bias along the way; as he says, “there needs to be a sophisticated strategy to deal with such entrenched opposition.” However, any discussion of bias that leaves his own chief platform out of the picture would be lacking. Jones should not be dismissed because of who he writes for. But his columns form part of a wider ecosystem, where references to “terrible missteps” will be decoded in a very particular (and not very radical) way. Drawing up a balance sheet of Corbyn’s leadership, Jones notes that “Labour has not once been ahead in the average of polls (which is what counts) since the last general election.” This is accurate, but it flattens out a clear distinction between three phases of Corbyn’s leadership. In the first phase, up to the end of February 2016, Labour consistently trailed the Tories by a wide margin; in the second, which lasted from then until the Brexit referendum, the gap closed to low single figures; it has since opened up again and stabilized as a double-digit lead for Theresa May’s party. A gap of 3-4 percent is still not good enough if Labour is aiming to win the next general election, but clearly doesn’t represent the same kind of problem as a gap of 13-14 percent. Any convincing narrative of Corbyn-led Labour thus needs to break the story down into parts. This begs the question, was making a good first impression ever a possibility? To a large degree the answer is predetermined by the media landscape, which was and is overwhelmingly hostile. In recent years, even left-wing backbenchers have found their media exposure limited — meaning Corbyn had a low profile entering the campaign. Once he did, and had some success with Labour’s voters, he was perceived as a threat by the established media. Socialism is not a novelty in Britain, as it was in the United States during Bernie Sanders’s recent campaign; it is, through the workers’ movement, the most significant and long-standing anti-systemic force in British politics. No substantial alternative media had been built, as it was by Podemos’s progenitors in La Tuerka, which might allow the mainstream press to be circumvented. This latter point is indicative. Before Corbyn’s election the Labour left had been marginalized for so long, with no real prospect of exercising state power, that its strategic thinking had been left to atrophy. It did not have a well-crafted program with widespread popular appeal, as Syriza did in Greece. Nor had it been experimenting with new ways of communicating anti-establishment politics, or organizing social movements, as was the case in Spain. Its default mode was principled opposition. Owen Jones was a leading figure in this milieu, which was unprepared for the historic opportunity that arrived in 2015. Decades of neglect were not going be remedied overnight by Corbyn’s victory — and will not be remedied by his removal, either. Jones notes that “elements of the parliamentary Labour Party [PLP] undermined Corbyn from the very beginning.” This is clearly true — but it understates the degree of impediment. In fact, so profound was the ideological gulf between Corbyn and much of the PLP that no amount of technical competence or charisma would overcome it. The majority of current Labour MPs had their formative political years during the long reign of Tony Blair and Gordon Brown. By and large, these are MPs who buy into a worldview which sees NATO as every bit as much of a Labour achievement as the NHS; that personify in their background, education, and political trajectory Labour’s transition to an elite party; that practice a parliamentarism which considers social movements, trade unions, and most organized grassroots activity to be a luxury at best. In other words, these MPs represent many of the things Corbyn was elected to oppose. And in turn, their opposition to Corbynism was an existential question for their political careers. The problems posed by this reality were evident when Corbyn assembled his first shadow cabinet. He opted for a relatively diverse selection, a conciliatory approach which was perfectly understandable in view of Corbyn’s weak support base within the PLP. But it meant storing up troubles for the not-too-distant future. On just about every significant issue, he faced a rebellion. The PLP dissidents also posed a grave challenge for any effective communications strategy. Every party has its backbench malcontents, but there can be few if any parallels for the relentless sniping that Corbyn has faced from Labour MPs with easy access to the national press. The varieties of undisciplined, attention-seeking self-indulgence on offer from the PLP have been endless. This “friendly fire” has not only damaged Corbyn, it has made the Labour Party look like a pantomime to the public, and undermined their ability to build support for any part of their policy agenda. Taking all of these factors into account, there was bound to be a period of chaotic improvisation after Corbyn became leader; the smooth, confident start that Jones was hoping for was never really in the cards. To compound this, the two biggest challenges that the Labour leadership had to grapple with between Corbyn’s victory and the Brexit referendum brought all of the party’s internal divisions to the fore. The first major challenge was posed by the rise of ISIS and the terrorist attacks that it carried out on French soil in November 2015. David Cameron had lost a parliamentary vote on military action in Syria two years earlier; the proposed target on that occasion had been the Assad regime, but Cameron later opted not to join the US-led coalition of states bombing ISIS-held territory in Syria, citing the earlier vote as a barrier. When the jihadists struck, the prime minister quickly brought forward a motion supporting air strikes, anxious to secure a place for Britain around the negotiating table. He was also well aware of the problems it would cause for Labour’s leadership. Corbyn was put on the back foot when the BBC’s political editor asked him if he would support a “shoot-to-kill” policy. As one of the few Westminster MPs with a deep knowledge of the British state’s record in Northern Ireland, Corbyn was perfectly aware that “shoot-to-kill” was a euphemism for the murder of unarmed civilians. Naturally, he refused to support any such policy, but went on to say that “of course” he would order the deployment of security forces to deal with Paris-style attacks. The BBC cynically fabricated the thrust of the interview, giving viewers the impression that Corbyn had ruled out the use of lethal force against gun-wielding terrorists. Even without this controversy, Corbyn would have been severely hobbled in his attempt to marshal Labour opposition. Atlanticist instincts go deep in the PLP; many Labour MPs feel there is something disreputable about failing to participate in any US-led military intervention. Corbyn’s foreign-affairs spokesman Hilary Benn was one of them, and he threatened to resign if Labour MPs were not given a free vote. When the parliamentary debate was held, Labour was at sixes and sevens, with the party leader speaking on one side of the issue, his shadow foreign minister on the other. This spectacle of disunity and incoherence certainly conveyed a very poor impression to the British electorate. But no communications strategy could have averted it. The only way to avoid the problem altogether would have been to fall in line and support the air strikes — not something that Jones would recommend, I’m sure, since he spoke at the protest rally in London a few days before the vote. If Corbyn had set out to build a more cohesive shadow-cabinet team from the start, and kept people like Benn away from the foreign-affairs brief, that would also have reduced the damage. Jones does not seem to be criticizing Corbyn for excessive generosity in his approach to Labour’s right wing; perhaps he should be. No issue generated more negative publicity during Corbyn’s first year in office than the second major challenge: allegations of rampant antisemitism among Labour Party members. This controversy has been authoritatively tracked by Jamie Stein-Werner and Richard Kuper, but a few points need to be stressed. Above all, the claims that Labour under Corbyn had become a “cold house for Jews” were completely baseless. A tiny handful of party members had been accused of making antisemitic comments; in every case, the allegations were investigated promptly, and action was taken when appropriate. Antisemitic attitudes appeared to be much less prevalent in the Labour Party than in British society as a whole. Corbyn himself repeatedly and explicitly condemned antisemitism. Yet the controversy refused to die — because it was never really about antisemitism in the first place. 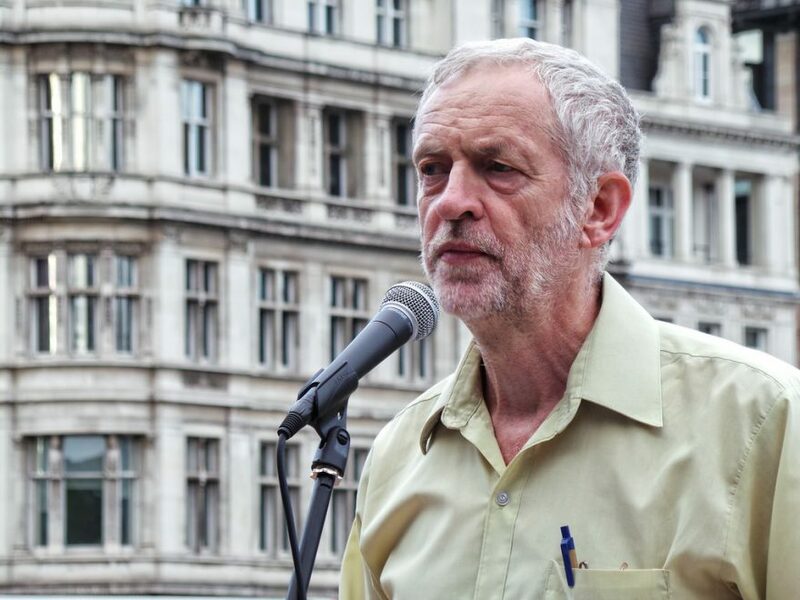 It was Corbyn’s support for Palestinian rights that had provoked the ire of his opponents. The British Labour Party had long been a reliable supporter of Israel, ever-ready to condone violence against Palestinian civilians. Netanyahu’s government and its British supporters were enraged by the prospect of a Labour leadership that would overturn this line, and responded by making false allegations that the party was riddled with antisemitism (a tactic that Keith Ellison has also experienced recently). The frenzy bore all the hallmarks of a coordinated campaign; it came as no great surprise when an Israeli embassy official was recorded discussing how to smear critics of his government in the Labour and Conservative parties. It was amplified by the preexisting hostility to Corbyn from much of the British media, and by the strong pro-Israel faction in the PLP. The only way Corbyn could have avoided this firestorm would have been to bend the knee and offer Israel his support — in which case all of the allegations would have melted away like snow in the spring. Some of Corbyn’s most strident critics were even on record defending open antisemites as long as they backed Israel. Again, there was no clever media strategy that could have protected Labour from the onslaught. The only self-inflicted wound in the whole affair came from Ken Livingstone, whose foolish, undisciplined intervention merely added fuel to the fire. Owen Jones himself seemed to have little understanding of what was at stake. His only notable contribution to the debate was a fairly anodyne article in March 2016, which said that antisemitism was a bad thing and that the Left should oppose it, but raised no questions about why, exactly, the issue was gaining so much traction at this particular moment. (By that stage in the controversy, the Financial Times had already published an extraordinary diatribe from the historian Simon Schama about “the Left’s problem with Jews,” to add to the other falsehoods). Other Guardian writers showed no such restraint, joining the smear campaign with gusto. A nadir of sorts was reached in October 2016, when the newspaper provided space to Israel’s ambassador Mark Regev so that he could claim the antifascist Cable Street demonstration of 1936 as the property of the modern Israeli state. A few days later, those of us who joined the eightieth anniversary march in east London saw one of the surviving organizers, Max Levitas, share a platform with Jeremy Corbyn and hail the prospect of a left-wing Labour government. I have dwelt on these two controversies at some length to show that any Labour leader with the same political outlook as Corbyn would have found themselves in the eye of the storm, even if they had possessed all of the qualities that Jones appears to consider desirable in a politician. Yet the ship remained afloat all the same. The elections suggest that, contrary to what his detractors say, Corbyn is not an apparent drag on the Labour vote and his leadership does not deter the party’s supporters from turning out. On the other hand, he has not given his party an electoral boost after last year’s general election defeat. If Thursday’s votes were replicated in a general election, Labour would lose again, with the Conservatives emerging as the biggest party in a hung parliament. Not a drag, not a boost — that was a fair summary of Corbyn’s contribution thus far, and little more than could reasonably be expected after the recent turmoil. Labour was not on course for victory, but it was within shouting distance of the Tories nonetheless. Then Brexit intervened. In the wake of the referendum, Corbyn’s opponents tried to generate an irresistible stampede, culminating in a no-confidence vote that was supported by the vast majority of Labour MPs. When Corbyn refused to capitulate, they had no choice but to trigger a leadership election, which dragged on until the end of September. In the course of that campaign, every kind of dirt was thrown at Corbyn and his supporters by senior Labour politicians, even in the final stages when it was clear that Corbyn would win. If there was any coherent motivation behind this at all, it seemed to be an attempt to poison the well so that nobody could drink from it in future. Meanwhile, the Tories had quickly put their house in order, choosing a new leader and embracing Brexit wholeheartedly. It would be foolish to imagine that the current Tory advantage stems exclusively from Labour’s difficulties. Theresa May has won back support from the UK Independence Party (UKIP) with her right-wing, Euroskeptic platform; and that was crucial for the victory in the Copeland by-election. The Tories could end up paying a heavy price for this “UKIPization” if the Brexit negotiations prove to be a fiasco. But in the short run, it appears to be a good electoral strategy. Jones responded to the Copeland result by branding it an unprecedented disaster: “Oppositions just do not lose seats in by-elections in normal circumstances.” True enough. It is also true, however, that the circumstances surrounding the two by-elections in Copeland and Stoke were anything but normal. Quite apart from the fact that Brexit has disrupted the entire political landscape, under normal circumstances, it would be inconceivable for a party leader to carry on after the great majority of his MPs have voted no-confidence in his leadership. Jones acknowledges the damage that was done by the attempted leadership heave, but appears to believe that the wounds should have started to heal by now: “Since the coup failure, Corbyn’s internal critics have remained largely silent, yet Labour’s polling has continued to slide.” It is true that there have been no further no-confidence votes or (many) explicit calls for Corbyn to resign. But the “silence” described by Jones is of a most peculiar kind. The absence of direct calls for Corbyn to go does not mean that Labour has been projecting a united front to the outside world. The first large-scale rebellion came barely a month after Corbyn’s second victory, when scores of Labour MPs refused to support a motion calling for investigation of Saudi war crimes in Yemen and a halt to British arms sales. We might have expected them to do so quietly, with a certain degree of shame. But MPs like John Woodcock trumpeted their support for the Saudi war effort, dismissing all the evidence of atrocities presented by humanitarian organizations. The Yemen vote illustrates the depth of the problem Corbyn has faced with the PLP. This was the first issue over which his opponents chose to defy the party whip after the second leadership election: not welfare or taxation, not immigration or the European Union, not Trident or NATO, but the right of Saudi Arabia to invade neighboring countries and massacre civilians. There is no conceivable electoral advantage at stake here; most people in Britain know very little about the war in Yemen, and would be unlikely to approve of it if they knew more. This is Labour Atlanticism in its purest form. These people will certainly find a way to rationalize British support for any wars that Donald Trump chooses to fight over the coming years. Even if they had no other disagreements with Corbyn, whether on matters of competence or principle, the breach with Washington would be enough to guarantee their staunch opposition to his leadership. Corbyn has also had to deal with another large-scale rebellion from MPs and even shadow-cabinet members over the Article 50 vote. This was a real catch-22 since, as Alex Nunns pointed out, if Corbyn had ordered his MPs to vote the other way, he would have faced a much bigger rebellion. Then there were the two by-elections, both in hotly contested seats, with Labour likely to lose votes to those in favor of Brexit in one direction and those against in the other. These elections themselves were triggered by MPs opposed to Corbyn resigning their seats at a moment when the party was low in the polls. Add to the picture public attacks on his leadership from Tony Blair and Peter Mandelson — the latter boasting that he worked to damage Corbyn “every single day” — and it is fair to say the silence was some way from a monastic vow. Labour’s left wing should certainly be thinking about a future without Corbyn — no movement can rely indefinitely on the leadership of a man in his late sixties, and no movement should be dependent on one man in any case. The question of succession should not be seen primarily in terms of individuals: the most important task is to build the kind of activist infrastructure that can provide support to any leadership team. Some useful work has been done on this front since autumn 2015, but not nearly enough. This is a collective responsibility, and we shouldn’t point the finger at anyone in the Labour leadership for that failing unless we’re also willing to point it at ourselves. A younger generation of Labour MPs has also come to the fore, especially since the second leadership election; some have been spoken of as future leaders. It is no disrespect to any of these MPs to say that they do not have the same track record as Labour politicians like Corbyn, John McDonnell, and Diane Abbott, who cleaved to the left when that meant consigning themselves to the political margins. This is not to claim that anyone who lacks such a record is bound to “sell out” if they end up taking over from Corbyn. But it matters a great deal how and when a successor comes to be chosen, and what the overall political dynamic is when they take the reins. Jones suggests that “if Corbyn decides he is unable to confront the multiple existential crises enveloping Labour, then an agreement should be struck where he can stand down in exchange for the guarantee of an MP from the new generation on the ballot paper who is committed to the policies that inspired Corbyn’s supporters in the first place.” There is no guarantee that any such deal will be on offer. Corbyn’s allies are currently trying to reduce the number of nominations that leadership candidates must receive from Labour MPs before they are allowed to stand: success on this front would be worth far more than any gentleman’s agreement. But suppose that a candidate with the same policy agenda, but a sharper approach to the media and a more charismatic leadership style, gets past the hurdles and takes over from Corbyn: what then? If they inherit a largely unreformed party apparatus, they will soon face the same internal problems as the current leadership. If Labour members have been led to expect a transformation in the party’s fortunes with a new leader at the helm, they would likely find themselves bitterly disappointed, and the pressure for compromise with the Labour right would intensify. The pressure that counts won’t come from the likes of me, people who warned Corbyn would be a disaster from the start. It will have to come from within the movement that carried him to power. Change will arrive when enough people inside the Labour left, Momentum, or those trade unions that endorsed him twice, conclude either that the experiment has failed or that ambivalence and passivity in the face of Brexit are no longer bearable. Any premature challenge risks playing into the hands of those who, like Freedland, want to return Labour to its previous condition as a reliably Atlanticist, pro-business party of the “extreme center,” devoid of credible answers to the deep structural crisis of Western capitalism. Labour’s convulsions over the past two years have been inseparable from that wider crisis. There could be no surer guarantee of failure than going back to square one now. Owen Jones’s call for Corbyn to stand down won’t solve Labour’s fundamental problems — but it could be a gift to the party’s right.